I play a variety of styles, but mostly claw hammer and minstrel music. This was a banjo I could afford but I don’t feel that it was a compromise in any way. The action is well set and it stays in tune. The hardware is of very good quality. The simplicity of its construction is aesthetically pleasing. I’m particularly pleased with the persimmon wood. The hardware is of high quality and durable. Patrick was very helpful and kind when I phoned him . A great banjo for the money that will last me for the rest of my life! The perfect clawhammer machine. Full, warm sound from high to low. Unbelievable clarity and richness of tone. It's also seriously loud, with tremendous sustain and resonance, but not over-bright, and no shrillness whatsoever. It sounds fantastic. Thought it might be quiet and plunkier, almost gourd-ish, but it's not, and I'm fine with that. Tuned down it only gets warmer. I could mute it for plunkiness but don't think I want to. It would seem criminal. Other, lesser banjos I've played require a heavy hand to produce any volume, or anything that doesn't just sound like a fingernail on a string. This banjo, for lack of any better way to put it, just wants to make sound. Sometimes I don't think it needs me. It sings out at any opportunity. Custom set-up using the very cool banjo design tool on the Pisgah website, and later some add-ons that Patrick was happy to accommodate. Easy to make changes. It's basically a Possum with walnut rim & neck, persimmon fretboard & tone-ring, short scale (25 1/2"), fretted, folk heel, John Balch goatskin head, brass armrest, Pisgah Hawktail tailpiece (Patrick recommended), Mulheron bridge, hard case. I contemplated spikes like I have on another instrument but after consulting with Patrick, decided against it at the last minute. Action was set at 5/32" at the 17th, which is standard for Pisgah. Earlier I had inquired about a lower action--1/18" at the 17th--but didn't want a buzz either, and left it to Patrick's judgment. Very happy with the result. Oh hell yes, it's easy on the eyes. Just pure Appalachian hardwoods from stem to stern with some brass hardware and the skin of a goat. Nothing shiny, nothing flashy. Inlay on the headstock is understated and handsome. Beautiful curves and grain to the wood. Could be brand new or 150 years old, which is exactly what I was looking for. I think the wood will only get prettier and gain character as I play and sweat farm-grime into it. Looks and feels as solid as a baseball bat. Hardware seems good. I may handle it like a sacred relic from time to time but don't need to. Patrick was supremely helpful and communicative from start to finish. Took about 3.5 months, as he said, which felt long in the waiting but is like nothing at all when you contemplate the end result. It's all about the wood and the workmanship here. Couldn't be happier. Was well-advised by many to test out all the banjos I could lay hands on as I contemplated a much-needed upgrade, and I tried out a few without going far afield. Never held a Pisgah but ultimately felt that the reviews/reputation, the domestic component parts, the emphasis on local wood, the many set-up options, the excellent design tool, and the attention paid to differences in sound made it so I could feel good rolling the dice. I purchased a 12" walnut possum from Pisgah Nov 2017 and couldn't be happier. Great sound on the woody side with the persimmon tone ring. Just what I was looking for. I haven't made any adjustments because it was ready to go out of the case. Everything is well appointed and craftsmanship is solid. Awesome tight wood inlays on the neck and on the persimmon headstock. Everything is high quality as expected. Pisgah is an awesome company to work with. Always quick to respond to questions. Components are well matched to the price of the instrument. This is a great banjo I can see owning for the long haul. Awesome woody tone that was exactly what I was looking for. Craftsmanship is notable and appointments are well matched to the instrument. Where Purchased: Pigsah Banjo Co. Here are my first impressions after about ten days with this lovely instrument. Its tonal range is far greater than I expected; I'm in awe. I was looking for mellow with long sustain,full, deep tone, and minimal muddiness. This banjo is that and more. When I attack aggressively,she (Her name is Petunia Possum Pigsah) is surprisingly LOUD; she can play relatively softly with a more gentle attack. She is highly responsive, with marked and welcome tonal variation, depending on where my right hand is picking (bare fingers) and, of course, my attack. I had hoped that the sound of a wood tone ring would differ markedly from my open backs with metal tone rings (Dobson tone ring/mahogany pot and neck; Whyte Laydie tone ring/ maple pot and neck). It does! This is one highly playable banjo; I love the action. Custom comes in because I asked Patrick if he could make me a short scale banjo with a radiused fingerboard and wood arm rest. He did. The setup as shipped reflects our phone and email conversations, and I don't need to change or adjust anything. The action is high relative to my other (metal tone-ring resonator and open-back banjos).It's perfectly suited to clawhammer and melodic style and to bare-finger picking. Initially, it seemed as though the head might be a little tight, but after playing Petunia over the past few days I suspect that the head tension may contribute to her extreme responsiveness. fretboard, and arm rest with antiqued brass hardware, amber tuning buttons, and quilted star inlay on the headstock add up to a perfectly coordinated, dignified personality. The vintage package, which includes the S-scoop. vintage head and vintage heel (persimmon over walnut) compliments the overall old-time feel and quiet elegance. Finally, the Pigsah Hawktail tailpiece as it extends over the head appears to have "grown there". It's a natural. I can take her (Petunia) anywhere! Though I haven't had this banjo in my hands for very long, my prior experience with Gotoh tuners suggests that the antiqued brass Gotoh tuners will be fine for the long haul. The wood finish is exquisite, and I expect it to hold up well. The antiqued brass hardware, which comes from Balsam Banjoworks should, if anything, look better with age; I expect that it will be highly durable. Finally, the Pigsah Hawktail tailpiece, also from Balsm Banjoworks appears highly durable. Finally, would I use it on a gig without a backup? Yes! I'd be perfectly confident, but my nature is such that I'd probably have a backup available just because I'm who I am. Patrick was a pleasure to work with. Our initial contact was by phone, followed by emails. We discussed every aspect of the build.I asked about a wood armrest,which was not listed on the site, and Patrick said he could supply one in persimmon to coordinate with the neck. Fifth-string railroad spikes at frets 7, 9, and 10 completed the picture. My quote arrived promptly as a PDF attachment to an email. All of this is a very long winded way to say that I couldn't ask for better communication and responsiveness. The banjo arrived in the time frame promised. Every component of this banjo is first class. Standouts include the persimmon fretboard and arm rest. If you like wood, you'll love Pigsah's native hardwoods. I didn't expect to fall deeply in love with persimmon. The short scale and radiused fingerboard are perfectly executed and greatly increase my pleasure in having this banjo in my hands. The neck is a pleasure to navigate.The aged brass hardware ladds a vintage "presence" without being clunky, and the Pigsah Hawktail tail piece not only compliments the appearance of the banjo, it also makes a very positive contribution to its action. The Renaissance head and the Pigsah strings seem to turn the instrument into a well-tuned (intentional choice of words) sound system. Terrific banjo, terrific buying experience. The build is solid and elegant. To my great relief, the finish appears "natural" and showcases the quality of the wood (I am not a fan of shiny nitrocellulose finishes). World-class build and attention to detail, world-class sound, world-class communication. I'm sure I'll be back for another Pigsah banjo at some point. I was looking for a sweet (but not TOO sweet), mellow (but not TOO mellow) old time slightly plunky sound for back-porch playing. I am a relative newbie to clawhammer (<1 yr) and don't play real aggressively, so I wanted a sound that matched my style. The banjo came with a sweet, full, loud sound, with a long sustain. I have made a few easy tweaks to get the sound I like. The banjo was set up with custom steel strings and a fairly tight head. I found it extremely easy to play, although I haven't measured the action. I put on nylgut strings and a minstrel bridge, and loosened the head a tad, which nicely shortened the sustain. I realize I'll have to tighten the head back up as it stretches. I ordered a custom Pisgah Hawktail tailpiece which I have not messed with.It sits very close to the head to help reduce overtones. Everything has been easy to fuss with, and it now sounds pretty much exactly like I want it to! I love the way it looks!!! I ordered a walnut pot and an add-on walnut armrest. The persimmon fretboard provides a nice contrast. I also asked for nickel hardware which I think looks good with the walnut. There was a gold-toned option which will develop a patina over time, but I've alway been partial to silver rather than gold. I also ordered the vintage heel, vintage tuners, small dot fret markers and a small inlaid star on the peghead - simple but very classy and keeping with the vintage look! I cannot find a single flaw in the construction or finish. It' appears to be a well-made, absolutely beautiful instrument. As mentioned above, the hardware and finish look sturdy and well-made. If I ever decided to do gigs, I would not hesitate to take it. This was my first experience with Pisgah, having only ever seen/heard their banjos online. I was thoroughly pleased with the contact and follow-up I got. I interacted with Patrick Heavner, and he was extremely helpful and accomodating to all my custom requests. I highly recommend him and the company for service. Standout components: sturdy hardware, especially the custom Hawktail tailpiece and vintage tuners. And fine-grained, beautiful woods. It's a bit scary ordering a banjo online, sight and sound unseen/unheard. But my experience purchasing the Pisgah Possum couldn't have been better. Friendly, accommodating service, and a quality product. Now that I have an easy-playing banjo with a great sound, I want to play more. I highly recommend the Pisgah Possum for an old time sound, and Pisgah in general for quality instruments. My Pisgah Possum arrived setup perfectly for my style of Clawhammer playing. I have not needed to change or adjust anything. It has a rich full bodied sound but very defined when playing higher notes up the neck. It growls when I get on it in Double C tuning. The walnut neck is quite responsive to the touch. I can feel the notes as I play them. This is a sought after feature I've learned to appreciate in some of my vintage guitars. It is easily one of the best sounding banjos I've ever had a chance to play here in West Virginia. I just happen to own it which is a big plus. A scoop after the 17th fret makes drop thumb and "cluck" tones easy to accomplish. The price I payed listed above is including shipping to West Virginia. Patrick Heavner and Pisgah did a very good setup on the Possum before it shipped. I have not needed nor wanted to change a thing about it. I can detect no bad overtones at all and that's without stuffing it. No need for that unless I just want to quiet it down. It's surprisingly loud. It is a walnut rim with a persimmon tone ring and fretboard. The rim has a cherry cap. It's appearance is a work of art in wood! Beautiful oldtime look to it that reminds me of walking in the mountains here in WV. 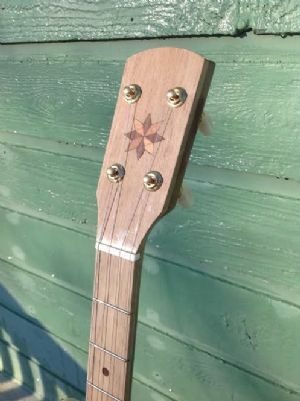 It has a quilted star inlay on the headstock which I like a lot and early on I had asked Patrick for antiqued brass hardware which he provided by Balsam Banjoworks which sets off the already striking oldtime look. The tuners are Gotoh and work very well. It stays in tune until I change it. It has a renaissance head with the "PBCO" logo down near the No-Knot style tailpiece. The overall appearance is pure oldtime elegance. Especially with the antiqued brass hardware. The hardware by Balsam Banjoworks not only looks great, it's sturdy and strong. All USA made parts. It will last a very long time. The finish on the wood is just enough to show the beautiful wood textures and patterns but not overdone. Pisgah's attention to fitup and detail is very impressive. I delt directly with Patrick Heavner at Pisgah on the phone and via email. He was very responsive to my every question and still is. It has a limited lifetime warranty to the original purchaser but I probably will never need it since I have no plans of breaking it. I take really good care of my instruments. 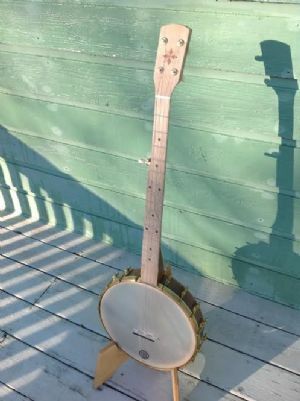 It's an oldtime mountain type Clawhammer banjo. It's uncluttered and elegant which I like a lot. Overall, the authentic oldtime construction and detail to tight fit-up combined with the blending of beautiful woods stand out in a crowd. It's not very heavy but feels well built and strong. To sum up, 12" walnut rim with persimmon tone ring and renaissance head, cherry rim cap, 3 piece walnut neck with persimmon fretboard, Aged brass hardware by Balsam Banjoworks, Gotoh tuners, solid construction. It has a heavy brass No-Knot style tailpiece and what looks to be a straight maple bridge with ebony top. I'm happy with the tone just as it is but may try some other bridges I have here just for fun. Perfect for clawhammer and other OT styles. It has a warm tone with the 12" Renaissance head and persimmon tone ring, but also has a bright, crisp "pop" to it, especially played over the scoop. It's also amazing loud for a wood tone ring (no banjo playing in the house after 10 PM). It was set up just right for me. I haven't made any adjustments so far and don't anticipate making any adjustments in the future. The action as shipped works for me and I like the medium gauge strings that came with the banjo. The stock bridge also seems good to me and I don't think I will change it. Walnut rim and neck, cherry rim cap and trim, and persimmon fingerboard. Brass hardware. Standard Pisgah star inlay on paddle headstock. 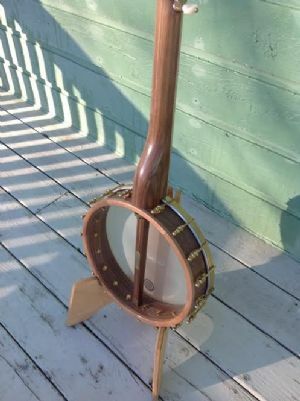 To begin with, the Pisgah banjo design is simple and elegant. All the woods and hardware are of high quality. Fretwork looks and feels very clean. Overall, a very clean build. I added a BanjoMate Slimline Armrest in curly cherry and it really pairs well with the banjo both in looks and comfort. Highly recommended. Patrick is easy to work with and very responsive. My wife and I visited him at his Warren Wilson College banjo building workshop this past summer and played a couple of banjos he had on hand (also played some Pisgah banjos at Acoustic Corner in Black Mountain, NC - a great musical instrument shop) and decided to order the Possum 12". Patrick quoted a specific build time and delivered within that time frame. No concerns or repairs anticipated at this time. Banjo has a limited lifetime warranty. All of the components are of high quality - Balsam Banjoworks. And, the tuners are Gotohs, which appear to work really well. I'm glad that Patrick uses Gotohs on his banjos. Nothing needs to be upgraded. Overall, a simple, handmade, yet elegant banjo with a warm, but crisp tone (not sure how that is possible, but that's what is sounds like) delivered at a reasonable price - with components made in the USA (with exception of Gotoh tuners). I really like the idea of Pisgah Banjo Company's sustainable business approach with the use of the Appalachian hardwoods and solar power to run their shop. And, it's great to do business with and support young and upcoming banjo makers, such as Patrick and his crew. A quintessential old time banjo, wonderful especially for clawhammer and bare finger picking. Full , deep tone but not muddy or plunky but clear and clean. Nice cluck over the scoop but not overly predominate. So far so good. I have just recieved the banjo but the bridge position was marked and perfect, only had to place the bridge and tune , intonation very good. Action is a bit higher than I'm used to, but I believe that adds to the growl and power this banjo produces. I may try a .065 bridge instead of the stock 11/16 it came with, but it may just take playing it a few more days.I must remember this is a banjo built especially for clawhammer and not Scruggs style picking. The wood quality is excellent. 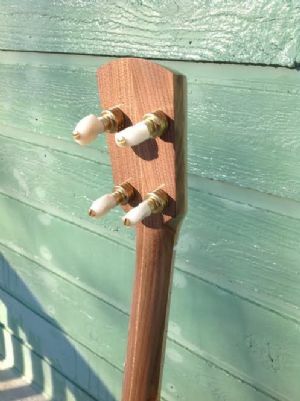 I chose walnut for the neck and pot as it is very light weight and very pretty, cherry rim cap and persimmon fretboard and tonering and peghead overlay. the finish is thin , not gloppy like so many imported banjos, really exudes "hand made".Finish is uniform overall , the wood grain is lovely, and the brass hardware really off sets the walnut well. No flaws, very well made and a great deal of attention to the final fit and setup. Hardware appears excellent, it is from Balsam Banjo works, proud to have an all American banjo. Finish is great, maybe will wear off in many years of play only adding to the character of the instrument. If someone hires me for a gig I'll bring it. Patrick Heavner was great to deal with, very easy and attentive to every email, even through a busy Christmas season. Banjo was ordered on 11/17/14 and delivered on 1/9/15. Warranty infor is on their website, looks fine. Standouts are the beautiful woods and American made brass hardware. No cheap parts, I may upgrade the bridge and get a vintage style wire armrest, but that is only personal preference. I would have liked them to supply a bracket wrench for the 5/16 hex nuts, but I guess I can fork out a few more bucks for one. The right sound for clawhammer.. I play a simple rhythm to back up my singing and this banjo is ideal for that. It's plunky but with some brightness too. I asked Patrick to raise the action a 1/16th of an inch to suit my style and he did..Of course the banjo came with the bridge lying down so I added a heavy Moon bridge and set it using harmonics. it's gorgeous... it's a 25 1/2" scale, vintage peghead, S scoop and the brass hardware. But the wood is just absolutely gorgeous - a work of art as I told Patick. Hardware looks great. I got a brass wire arm rest to go with the brass hardware and the whole thing looks great. I don't see any problems down the road with that brass wearing out. Well, if you've dealt with Patrick you know how responsive he is. Lots of emails passed between us and he always responded in a timely way. I also appreciate how he asked me about the action and told me what they tend to set it at. Then I measured on my other banjo and realized I needed another 1/16".. that's the way it arrived. Those Gotoh tuners have always been my favorites. To me they hold a tune better than any others. I don't see any need to change those. My goal as a banjo player as I mentioned is really to use it as backup for my singing. I'm sure someone else with better banjo chops would appreciate this banjo even more than I do.